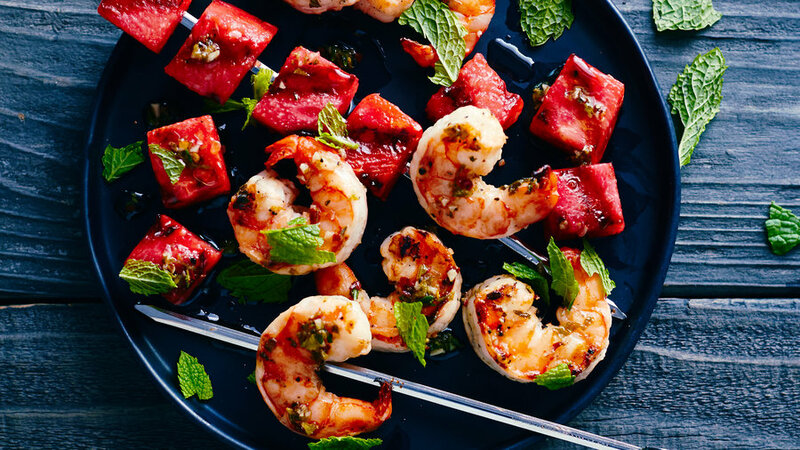 Grilling watermelon adds a smoky note to the fruit and gives it a slightly meaty texture that matches well with shrimp. Cooking takes only a couple of minutes, so have both sets of skewers ready before you start. You'll need 12 flat metal skewers (12 in. long) or 18 skewers (8 in. long)—or use bamboo skewers of the same size, soaked in water for 30 minutes. A Chinese takeout favorite ― only lighter and quicker when you make it at home. 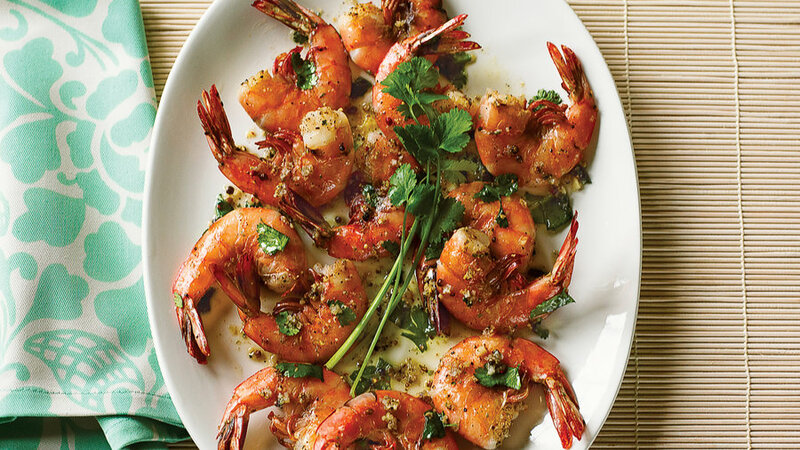 A mere 20 minutes, and you can serve up juicy shrimp flavored by a rainbow of peppercorns. 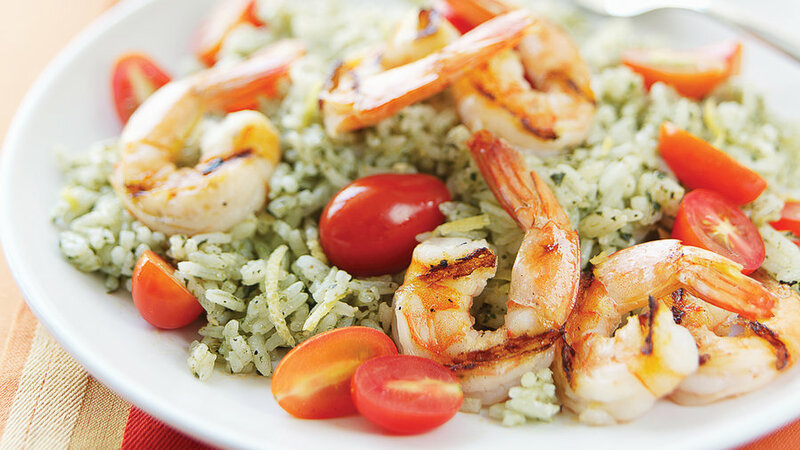 One of our all-time favorite grilled shrimp recipes, this main dish is sure to please a crowd. 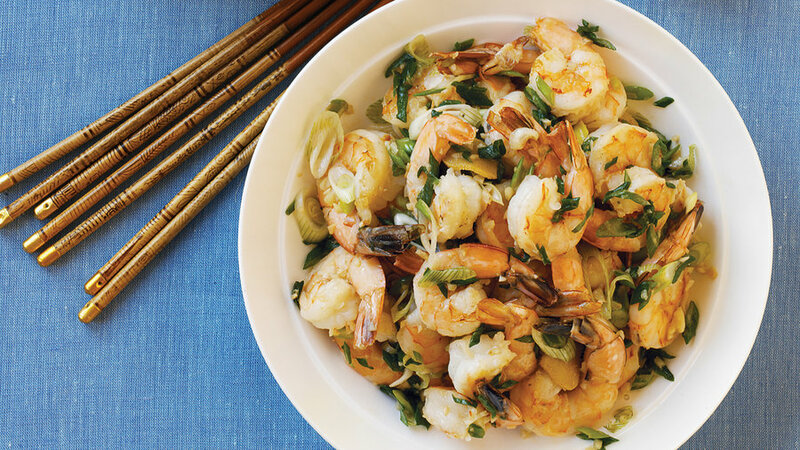 Lemon and garlic bring out shrimp's fresh sweetness. Bacon adds a smoky depth of flavor to the classic pairing of shrimp and grits. 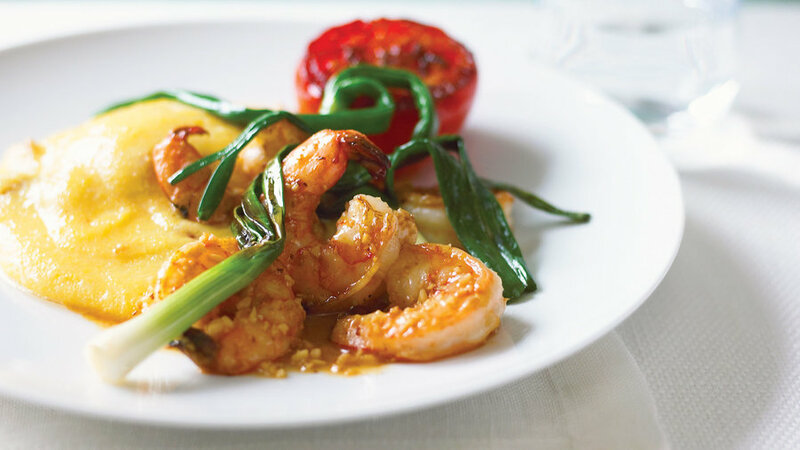 Green onions and halved tomatoes are a fresh complement to cheesy polenta and succulent shrimp. 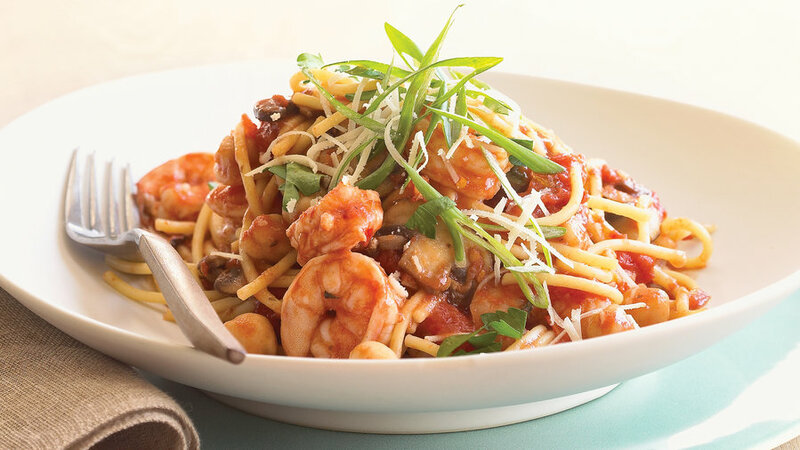 This one-pan dish combines chickpeas, shrimp, and savory Mediterranean flavors. In the mood for something new? Give millet a shot. 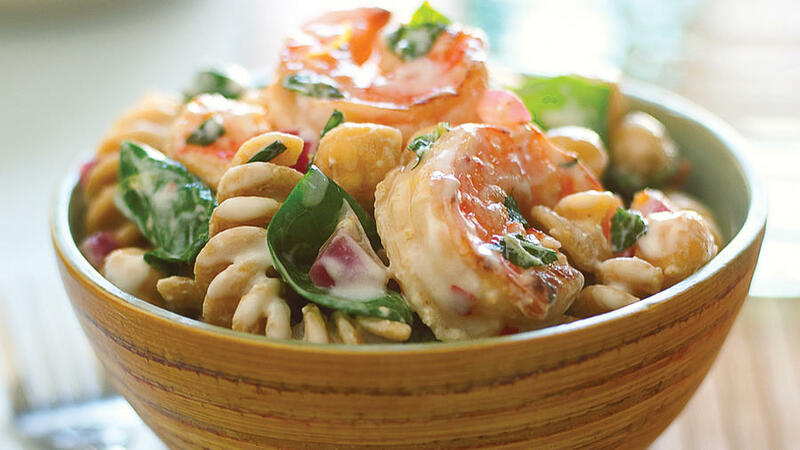 The ancient round grain has a nutty flavor that's perfect with crisp spinach and toothsome bay shrimp. Try this healthful salad as a light lunch or dinner served with some crusty, whole-grain bread. 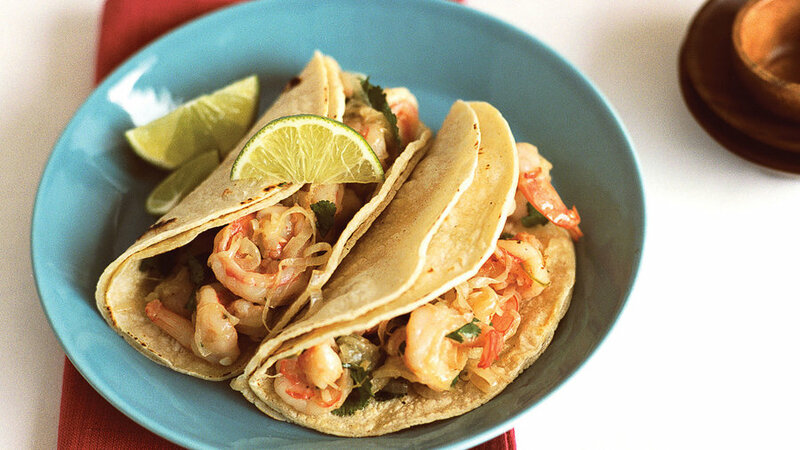 Here's a cool weeknight meal. 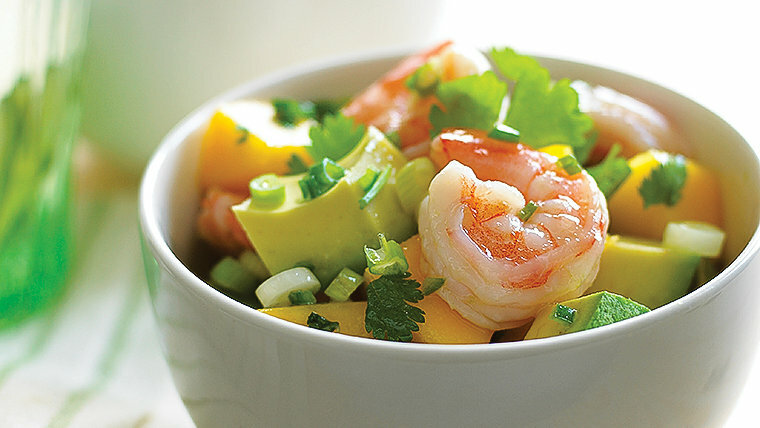 Few can resist the sweet and creamy combo of shrimp, lime, avocado, and mango. Spiced up with a hint of chile heat, it's a one-bowl, no-cook no-brainer. Looking for a dinner that tastes like summer? 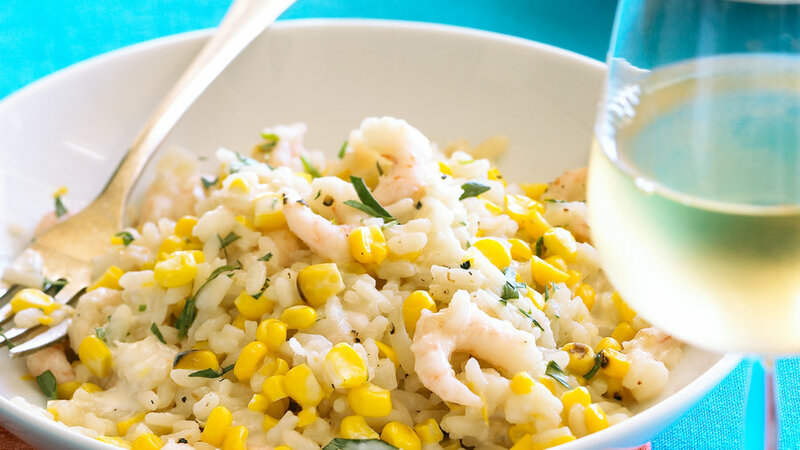 Rice gets some spark from lemon zest and pesto, and the promise of smoky-hot shrimp gives you a reason to fire up the grill. Prepared pesto makes this dish a snap, but by all means, use homemade if you have it. This warm one-pot meal is a perfect pick-me-up on a cool night. 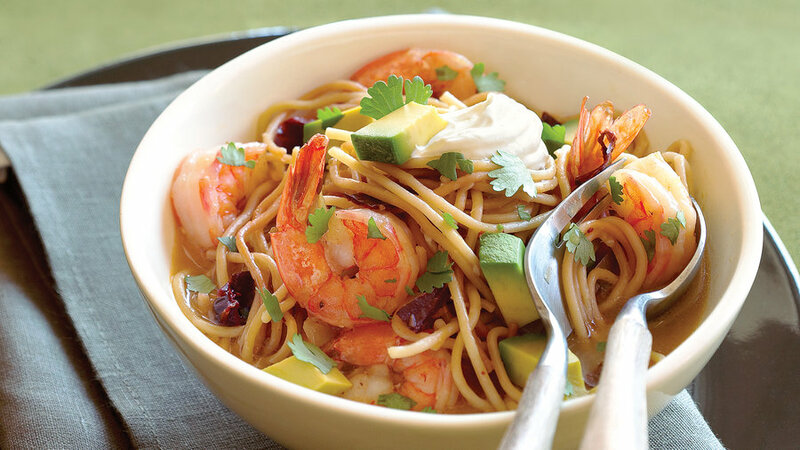 It's technically a "soup," but there's nothing wimpy about a bowl of hearty noodles and juicy shrimp. 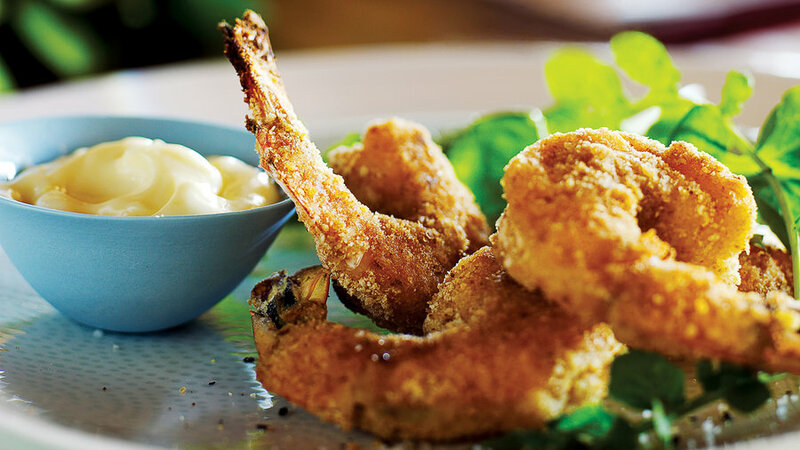 Oven-baked to irresistible golden brown, these shrimp are a surprisingly elegant take on a crowd-pleasing pub classic. Use them to top a salad, or set them out as a cocktail party finger food. 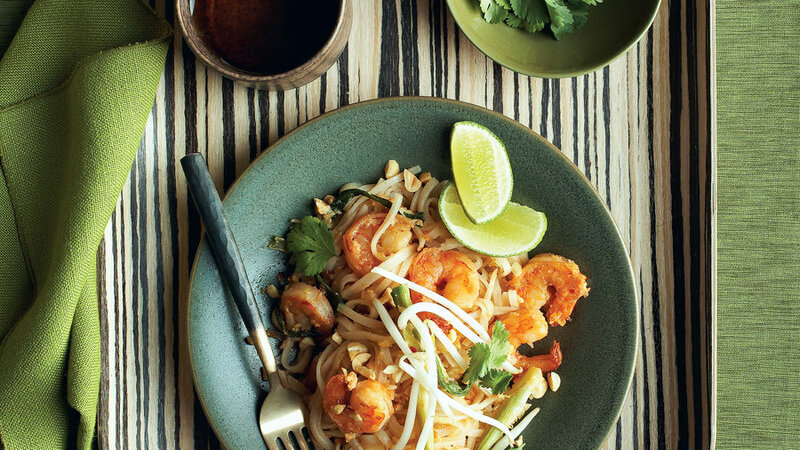 Pair with a crisp white wine, like a Sauvignon Blanc or Semillion blend. Put down the phone. Step away from the take-out menu. Yes, you can make Thailand's most famous street food. It's easier than you think. In 45 minutes and with ingredients you can find at a well-stocked grocery store, put together a noodle dish that's healthier and quicker than takeout. Don't forget the limes; their juice adds the perfect zing. 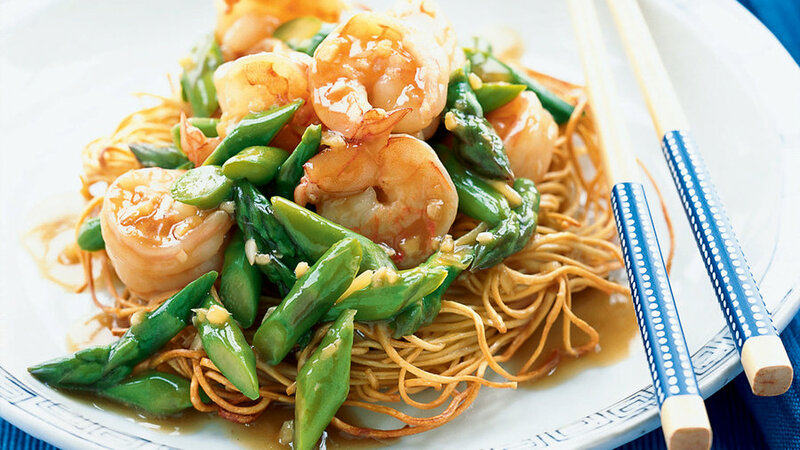 Savor fresh asparagus in this quick stir-fry that pairs juicy shrimp with crispy noodles. For guilt-free crispiness, bake the "pillows"―actually noodle nests―in the oven while you finish the stir-fry. 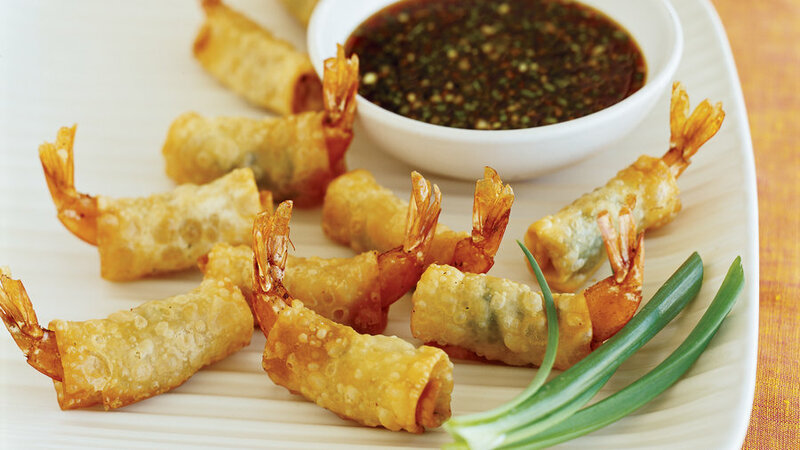 Wrapped in golden-crispy wonton skins, these shrimp pair perfectly with their tangy citrus dipping sauce. The trick to succulent shrimp in this recipe is a simple salt "massage" that cleans the shrimp and makes them crisper. Full of fresh, green flavors, these wraps can be a light appetizer or a meal. Just add a crisp-crusted French baguette or steamed rice. 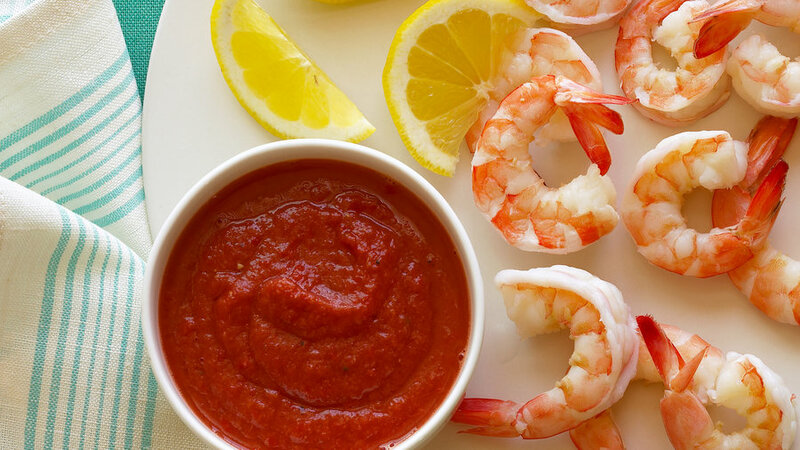 Not the jar this time: Pair your shrimp cocktail with a fresh, tomatoey sauce you whip up yourself. 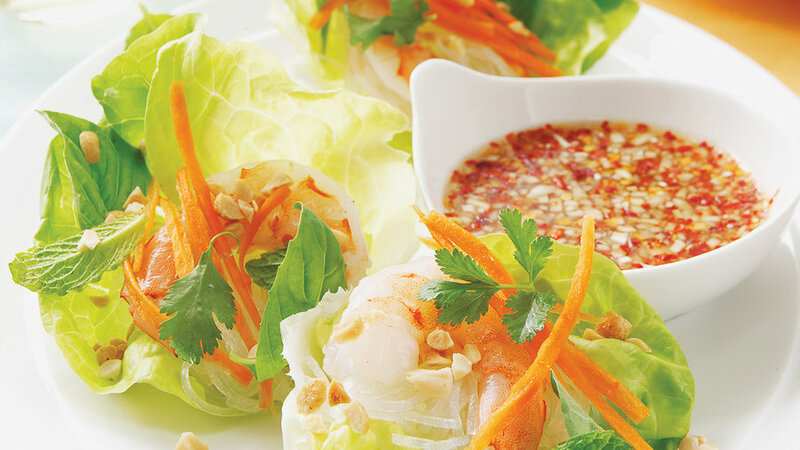 Serve it with a pile of cooked and chilled jumbo shrimp for a light and fresh appetizer. 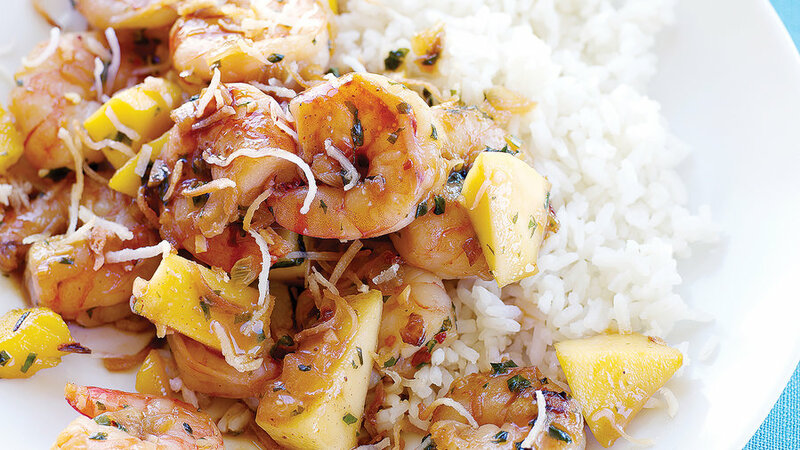 Sweet and juicy mango mirrors the flavor of perfectly cooked shrimp, while toasted coconut adds crunch. Basil, soy sauce, and a sprinkling of hot pepper give spice to this 30-minute weeknight dinner. 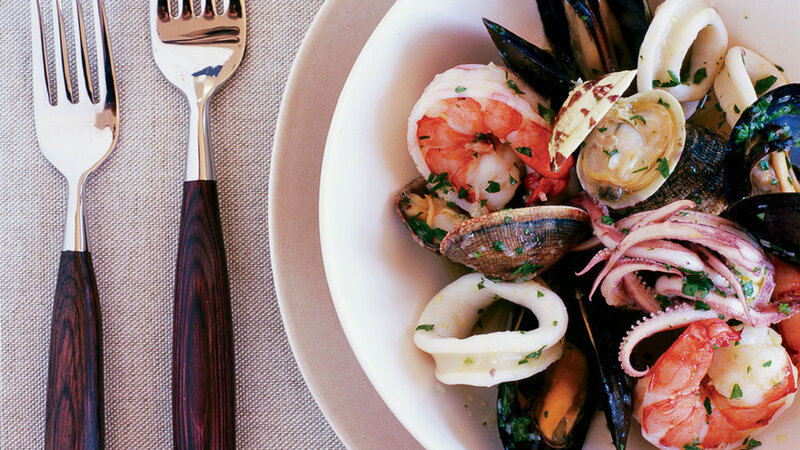 We love this streamlined version of classic cioppino. 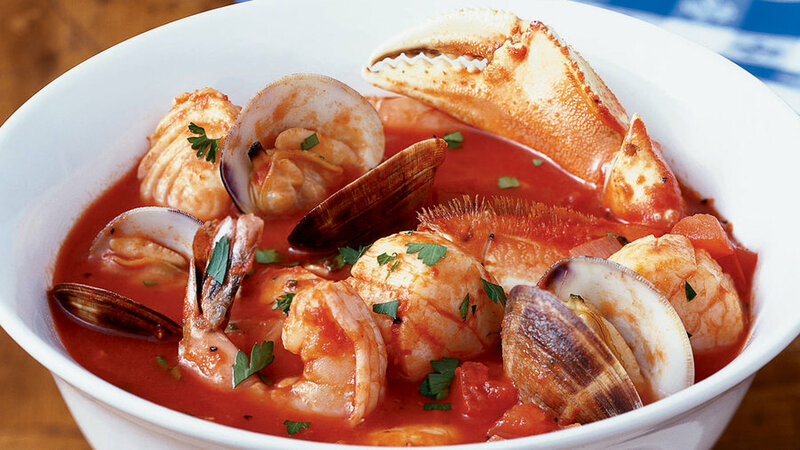 Tomatoes, white wine, and a satisfying medley of seafood make this hearty stew a great go-to for special entertaining. 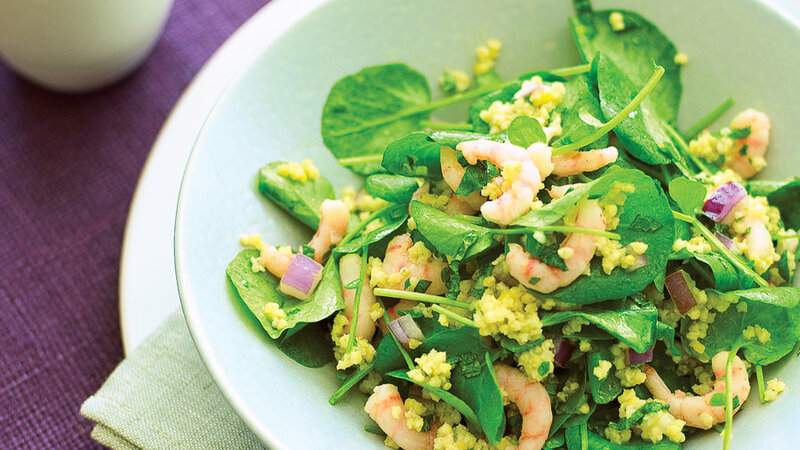 Shrimp’s delicate sweetness stands out in this lemony seafood salad; serve it with hunks of crusty bread for dipping into the delicious dressing. 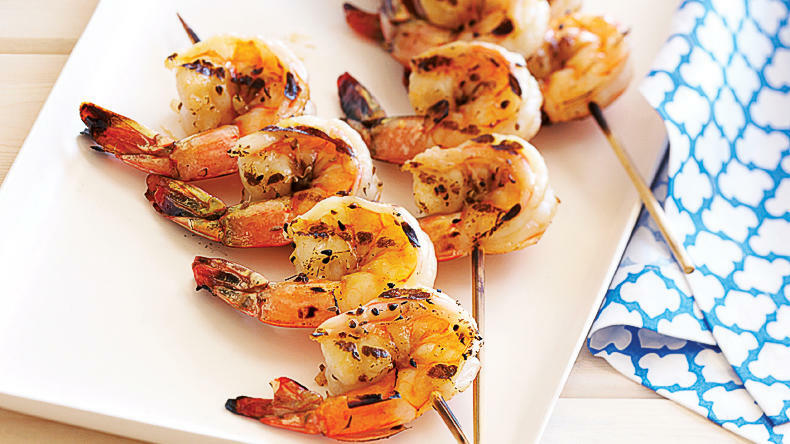 The secret to perfectly grilled shrimp: Rub them with salt and sugar before cooking to seal in juiciness and sweetness. We love them with a two-punch licorice hit of anise seeds and ouzo. We'll confess: We swapped low-fat Greek yogurt for mayo and whole-grain rotini for white flour because we were thinking of our waistlines. But after we tasted the creamy tang of the yogurt dressing and the hearty bite of the pasta, we didn't want to go back. Spinach is another healthy ingredient in this meal in a bowl.